The Fouga Magister (company designation CM.170) is a 1950s French two-seat jet trainer. The related CM.175 Z�phyr was a carrier-capable version for the French Navy. Although it is often lauded as the first purpose built two-seat turbojet-powered trainer aircraft, similar claims are made for the Fokker S.14 Machtrainer whose first flight, production, and service entry were all about year earlier.. However, the Magister was much more successful than the Machtrainer, being produced in far greater numbers and being exported to many nations. In 1948, Fouga designed a jet-powered primary trainer called CM.130 for the French Air Force (Arm�e de l'Air, AdA) to replace piston-engined Morane-Saulnier MS.475 aircraft. When AdA found the aircraft lacking in power from the two Turbomeca Palas turbojets, Fouga enlarged the basic design and used the more powerful Turbomeca Marbor� engine. The distinctive V-tail of the new CM.170 Magister originated on the CM.8 glider Fouga was using to experiment with jet engines. In December 1950, AdA ordered three prototypes, with the first aircraft flying on 23 July 1952. A pre-production batch of 10 were ordered in June 1953 followed by the first production order for 95 aircraft on 13 January 1954. Fouga built a new assembly plant at Toulouse-Blagnac to produce the aircraft. The aircraft entered service with AdA in 1956. Due to different industrial mergers, the aircraft has been known as the "Fouga CM.170 Magister", "Potez (Fouga) CM.170 Magister", Sud Aviation(Fouga) CM.170 Magister" and "A�rospatiale (Fouga) CM.170 Magister" depending on where and when they were built. The French Navy's Aeronavale adopted a derivative of the Magister, the CM.175 Z�phyr, as a basic trainer for deck landing training and carrier operations. These were preceded by two "proof of concept" prototypes designated the CM.170M Magister, which made their first flights in 1956/57. An improved version of the Magister designated the CM.173 Super Magister was produced from 1960. It used a more powerful Turbomeca Marbor� IV engine. Production of the Magister stopped in France in 1962 but continued to be built in Finland up to 1967. The development of the aircraft came to an end when the French Air Force selected the Alpha Jet as their new jet trainer. The first export customer was Germany who ordered 62 aircraft from Fouga and Flugzeug Union Sx�d licence built a further 188 aircraft. In addition the CM.170 was built under license by Valmet in Finland, and Israel Aircraft Industries in Israel, with a total of 929 built. Of these 286 were completed under license. The Israeli Air Force operated a licence manufactured version, the IAI Tzukit. While principaly a trainer, it was used in the 1967 Six Day War as a Close Support Aircraft, being used to attack targets on the Egyptian front during the first day of the war, when Israel's more capable combat aircraft were deployed on Operation Focus against Arab air bases. They were then deployed against Jordanian forces, including armour, on the West Bank. The Magister proved effective at the close-support mission albeit with heavy casualties, with six being lost. In 1958-1959, Finland purchased 18 Fouga Magisters from France. At the same time they also obtained a manufacturing license. The Finnish aircraft manufacturer Valmet later built 62 Fouga aircraft between 1958-67. The French built aircraft carried the designations FM-1...-18 and the Finnish built FM-21...-82. The aircraft was a jet trainer in the Finnish Air Force between 1958-1988. Twenty-one Fouga Magisters were destroyed in accidents, six with fatal outcome. The usual Finnish Air Force nickname for the plane was Kukkopilli (Ocarina) because of the peculiar sound of the Turbomeca Marbor� turbojet. When Congo became independent from Belgium in 1960, the secessionist movement in the province of Katanga rebelled against the central government. Their minuscule air force was equipped with a few Fouga Magisters among other aircraft. ONUC, the UN operation to safeguard the survival of the Congolese state 1961-64, fielded one squadron of Swedish SAAB Tunnan and one of Ethiopian F-86, which consistently outperformed the Katangese Magisters in the air. The Irish Air Corps operated six Fouga Magisters, four of which equipped the Silver Swallows display team. The Brazilian Air Force used the Fouga Magister in Smoke Squadron from 1968 until 1975 were designated (T-24). CM.170 Magister - three prototypes and ten pre-production aircraft. CM.170-1 Magister - first production version with Turbomeca Marbor� II engines, 761 were built including 188 in West Germany, 62 in Finland and 50 in Israel. CM.170-2 Super Magister - uprated Marbor� VI engines with 4.7 kN (1,055 lbf) thrust each, 137 built. CM.173 Super Magister - Marbor� Super VI engines with 5.1 kN (1,143 lbf) thrust each and ejection seats, 1 prototype built. CM.175 Z�phir - A shipboard trainer for the Aeronavale, with strengthened undercarriage, catapult attachments and arrestor hook. 30 built. Fouga 90/90A - Development based on the CM.170 with Turbomeca Astafan engines with 7.6 kN (1,715 lbf) thrust each, reshaped canopy for better visibility, and upgraded avionics. 1 prototype built. Proposed version 90A was equipped with a 790 kp Turbomeca Astafan engine; both versions failed to attract orders. Honduran Air Force operates like 4 aircraft in service. Up to 140 kg (310 lb) of weapons on two underwing hardpoints, including 50 kg (110 lb) bombs, unguided rockets, and Nord Aviation SS.11 anti-tank missiles. Kopenhagen, W., ed. Das grox�e Flugzeug-Typenbuch. Stuttgart, Germany: Transpress, 1987. ISBN 3-344-00162-0. Arys, Marc & Heerthum, Serge van. 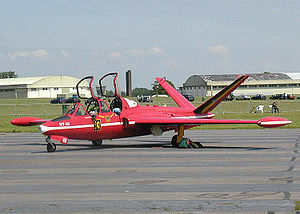 Fouga Magister : whistling Turtles in Belgian skies, 'Flash Aviation', 2007. ISBN 9071553248. Taylor, John W. R. Jane's All The World's Aircraft 1965-66. London:Sampson Low & Marston Company, 1965. Fouga Magister Pictures and Fouga Magister for Sale.